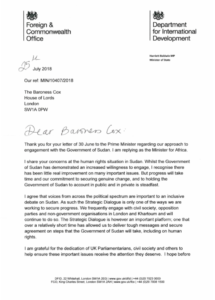 We received a response to our open letter, signed by over 500 politicians, civil society organisations and individuals, that was handed to 10 Downing Street on June 30th, following the All Sudan Demonstration. 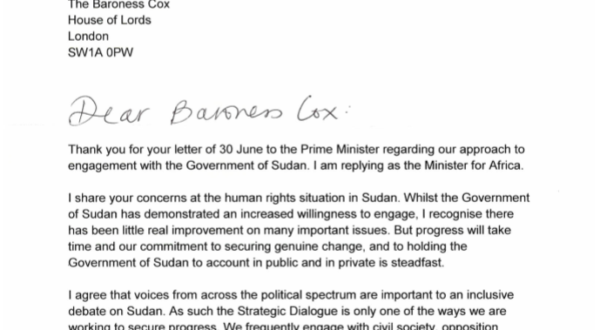 Sent from Harriett Baldwin MP, Minister for Africa, on behalf of the Government, the letter accepts that more can be done by Sudan to ensure human rights are upheld. Thank you for your letter of 30 June to the Prime Minister regarding our approach to engagement with the Government of Sudan. I am replying as the minister for Africa. I share your concerns at the human rights situation in Sudan. Whilst the Government of Sudan has demonstrated an increased willingness to engage, I recognise there has been little real improvement on many important issues. But progress will take time and our commitment to securing genuine change, and to holding the Government of Sudan to account in public and in private is steadfast. I agree that voices from across the political spectrum are important to an inclusive debate on Sudan. As such the Strategic Dialogue is only one of the ways we are working to secure progress. We frequently engage with civil society, opposition parties and non-government organisations in London and Khartoum and will continue to do so. The Strategic Dialogue is however an important platform; one that over a relatively short time has allowed us to deliver tough messages and secure agreement on steps that the Government of Sudan will take, including on human rights. I am grateful for the dedication of UK Parliamentarians, civil society and others to help ensure these important issues receive the attention they deserve. 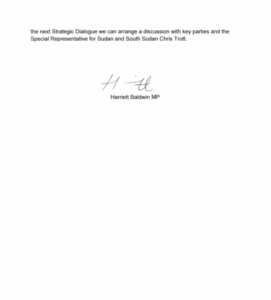 I hope before the next Strategic Dialogue we can arrange a discussion with key parties and the Special Representative for Sudan and South Sudan Chris Trott.